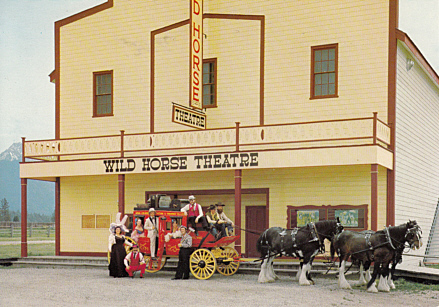 Front Text: inscription: "Wild Horse Theatre"
Reverse Text: "Fort Steele, British Columbia. Highway 93, in Kootenay Country. Olden days are re-enacted as the Stage arrives, pulled by 4 magnificent Clydesdale horses. Get your tickets NOW to enjoy this saucy live theatre presentation."